Sign on at the Lakeside Sports and fitness gym, Station Rd, just off the Kilmaine Rd, Ballinrobe from 6pm to 8pm Friday 8th and Saturday Morning from 7.30am to 9am only. At Sign on you collect your bid (number) this is to be worn on the front of your jersey or top (use pins) and your timing chip to be worn on your left ankle. 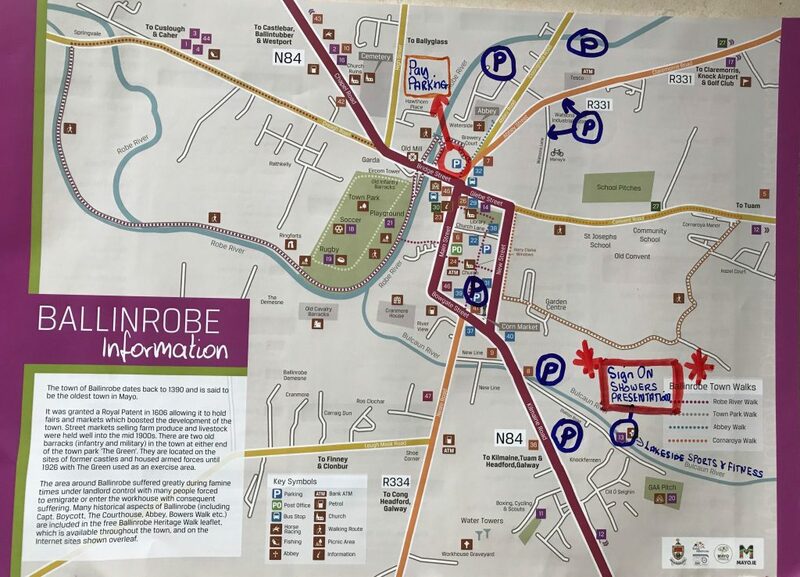 Please note that pay parking applies in Ballinrobe, please see map for areas that don’t charge for car parking. Can use this map to navigate around the town. Ideally we would like everyone to park around the Lakeside Sports and fitness gym. (Start, Transition and Finish area) this area will be open from 8am at Abbey street car park (Outside Abbey Tyres). Please rack your bike in designated area for your number. We want to keep car park spaces at Abbey St free so only use this area for bike drop off..
Race briefing, at 9.45am at the Transition area in Abbey St.
Race Starts at 10am sharp. 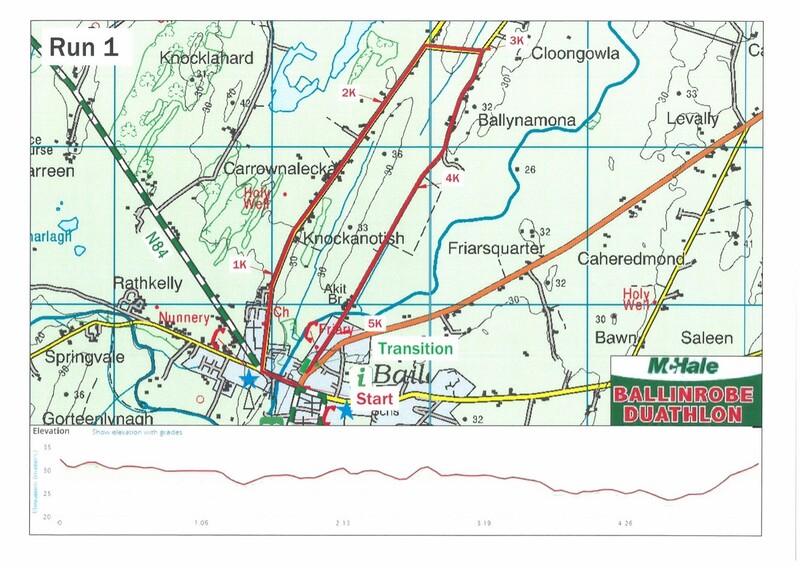 5.3k Run, The start line will be outside the old Ulster Bank at the top of Bridge St, it’s a fast downhill run before turning right for High St, the run is rectangular in shape and is very flat, the second right turn is at 3k and again at 3.3k onto the Cloongowla rd, stay on the right hand side of the road, follow signs to Transition in Abbey St.
At Transition: first put on your helmet before you lift your bike, walk out to road side to Mount your bike before getting on your bike. Keep your eyes open and be aware of the traffic. Remember don’t block other competitors be mindful…. 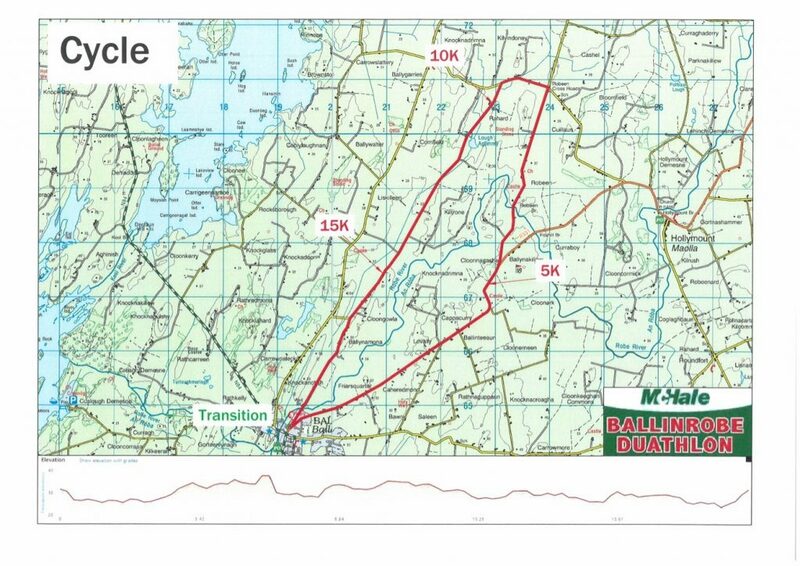 Cycle out of town via the Claremorris road, keep your EYES open as there are very busy shops and garages for the first km out of town. 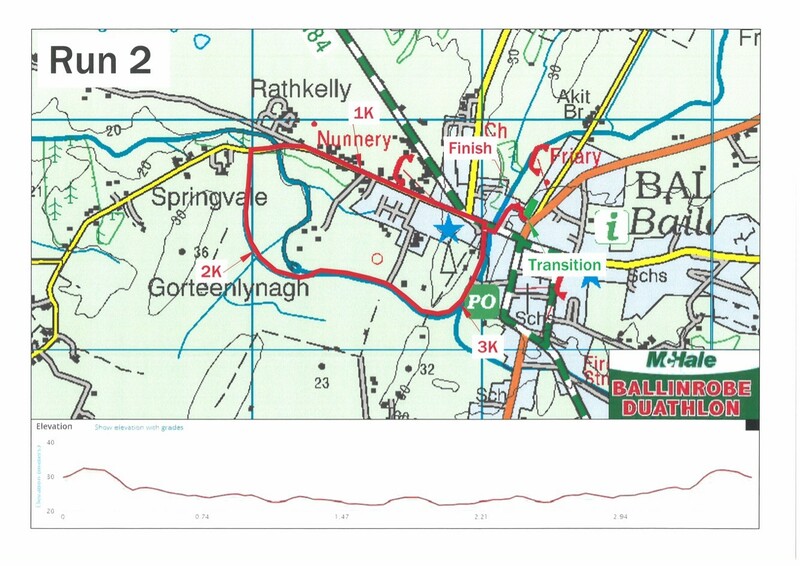 Follow roads arrows straight for 5k veer left at Cloonacastle for Robeen at Robeen cross roads turn left for Ballygarris 700m later, turn left for Ballinrobe via Cloongowla, when approaching the town beware you are in a built up area and traffic can come from any direction, when you get to the Dismount sign GET OFF your bike and walk into Transition, Rack your bike at the same place where you took it from. Please obey the rules of the road and the rules of the sport. TI rules apply (No drafting on the cycle) Motorbikes and static marshals in place. From transition run/walk into Brewery court follow arrows signs up and onto the Creagh road, keep left on the footpath, left on to Bowers walk keeping river on the right, back to Brewery court finishing at Abbey St. Slower runners may meet faster finishing runners on the Town weir bridge so always allow the faster runner right of way. Please hand back your timing chip…! €30 fee if you don’t. Everyone who finishes will get a lovely cool pot of Breyers Delight ice cream, we also have water, fruit and some jellies at the finish Marquee. Those who win a prize, please stay around as we are taking pictures there for the local papers so we need you in your race kit. This will be done at the podium area. Provisional Results are live at the Core Timing vehicle so have a look. Guys we are always doing our best to keep Mayo towns clean so leave “No Trace ” put all rubbish into the bins provided. Provisional results will be available so we can announce the prize winners at The Lakeside Sports and fitness gym from 12.30pm. The full results and stage breakdown will be posted on our website www.raceface.ie and on our event Facebook page. We will have some light refreshments for the prize winners at the presentation. Thanks to our Main sponsor Mc Hale’s engineering and supporting sponsors Vaughan Shoes, Ballinrobe physiotherapy and Chia seeds. The event is supported by Mayo county council, Ballinrobe Men’s shed group, Western Lakes CC, Ballinrobe Tidy towns, the RSA, Ballinrobe TUS group and Order of Malta. 1st Three relay teams, or first All Male, Female and Mixed squads depends on numbers in each category. First Local (5K Radius) Male and Female. Will be available at the Lakeside Leisure centre on Station rd (Kilmaine rd) directly after the event. Mc Hale engineering Ballinrobe are the main sponsors of this year’s event. Vaughan Shoes with shops in Claremorris, Castlebar and Ballinrobe. Each sponsor all promote healthy living and outdoor activity.